We've successfully mapped 20-30 other domains to various other multisite installs using the domain mapping plugin but this one isn’t working for some reason. We've quintuple-checked all settings (i.e. correct A record in Name.com, set up domain in the WP Engine portal correctly, and even tried creating a redirect rule in WP Engine’s dashboard as a last result but no dice). 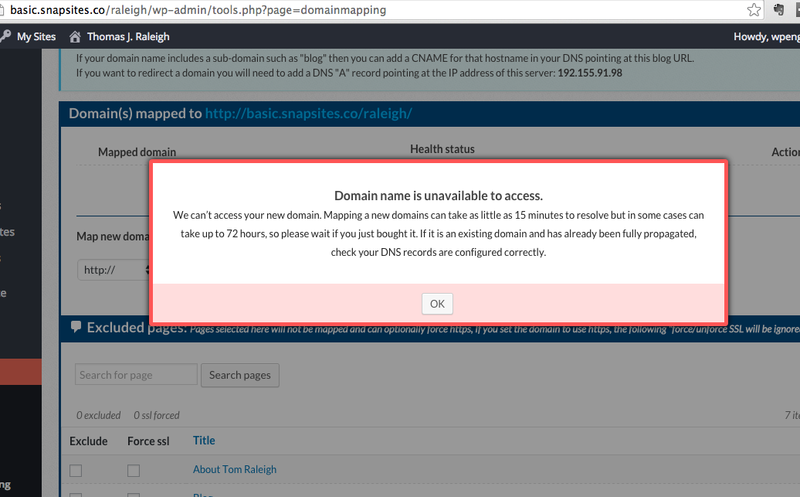 The domain mapping plugin still can’t resolve the domain for some reason. We enabled WPMU back-end access. Feel free to let us know if you have any issues. How long ago did you setup the mapping ? Sometimes A records may take a while to propagate. Can you update to the latest version of DM and clear cache, mainly object cache in the WPEngine dashboard. Hi Jude, thanks for the reply. We’ve been trying to map this domain for over a week now and still throwing errors. I’ve updated WPMU DM plugin, flushed all possible cache, triple checked settings (screenshots attached) and still won’t allow this domain name to map. I’m pulling out my hair trying to figure out what’s going on. Any insight would be appreciated. Thanks in advance! Hi Jude, just wanted to check in with you to see if you were able to diagnose the bug with the domain mapping plugin. If you think it may be something that is an inherent glitch with the latest release of the plugin (that was released on Tuesday), I'll simply install another domain mapping plugin as a temporary solution until this bug can be identified. Thanks in advance for any help or insight. Do you have any redirection on your mapped domain ? If yes, you need to remove them, and only have A record pointing to your multisite IP. Hi Anang, we've simply stripped out the WPMU Domain Mapping plugin from all of our installs and are using a different domain mapping plugin. Hopefully WPMU will be able to figure out what the bug is that everyone is experiencing and I'll check back after a few releases to see if may be ready for us to use again. Thanks. 1. Try disabling the Verify DNS option in the Domain Mapping settings. 2. If you're using Multisite Privacy (another of our plugins) try disabling it while you map your newest domain. 3. Also try disabling the site admin options at the bottom of your fourth screenshot, above. Thanks! If you'd rather wait, that's fine, too, but I've seen some similar issues with other users and we were able to work around them with one or more of the above steps.